Shannon Cottage is a recently converted workers cottage which provides lovely holiday accommodation within the South Downs National Park and is minutes from the Sussex Coast. You find the light and airy open-plan living area on the first floor, it has a sofa and armchair and direct access to the rear terrace via patio doors. The modern kitchen has everything you could need during your stay including a full oven, hob, fridge and microwave. There is also a freezer available in the ground floor storage room . There is a small dining table for two as well as a Freeview television and Wifi. The bedroom has a king size bed, chest of drawers and hanging hooks available. There is an additional cupboard space accessed from here useful for storing suitcases and larger luggage. The bathroom is directly opposite with a full bath and shower overhead, WC and basin. There is a large terraced area which leads to a tiered garden and there are views directly onto the parish church of St Laurence and the village. There is a useful bike storage shed provided. Telscombe is a unique village in East Sussex. Nestled in a crook of the Downs about two miles from the coast is one of the prettiest villages in Sussex. 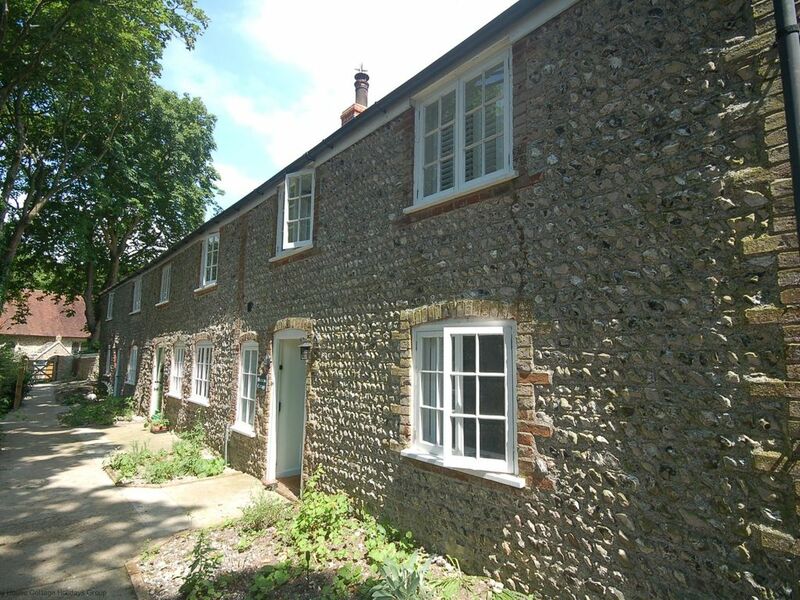 For walkers Shannon Cottage is ideally located for joining the South Downs Way at Southease just one mile away. You can continue from here on a 9 mile walk over the Blackcap to Lewes where you can experience the superb views, particularly to the south and east. Cyclists will also enjoy the easy access to the Egret's Way and the Ouse Valley Cycle Network. The nearby village of Piddinghoe offers direct access to the River Ouse which has rowing and sailing activities available at the marina. Ground floor compact bathroom with full bath and shower overhead, wc and basin. Superb, fantastic cottage in a fantastic location. Fantastic little cottage super location for walking and for driving out for the day. Thank you for taking the time to leave a review regarding your recent stay at Shannon Cottage. We are delighted that you enjoyed your stay and hope that you will choose to stay with us again in the future. Peace and quiet galore, but at the same time easy access to Lewes, Brighton, Battle, Newhaven, Charleston, Monks House , and of course, the Downs! Shannon Cottage was everything and more. Perfectly clean and comfortable. We enjoyed the vase of daffodils and the pint of fresh milk in the fridge. Perfectly situated for walking. Also the bed was the most comfortable one and we are due for a new one so will be buying the same. Thank you for taking the time to leave a review regarding your recent stay at Shannon Cottage, we are delighted to hear you enjoyed your stay and hope that you will choose to stay with us again soon!